I had long pondered how to make an image like this. Images with a single line passing over and under in a systematic way have a long history in decorative art. My thought was to have the line pass along a random path in an "interesting" way. I have never seen another similar image. The trick is how to make the line wander "at random" without leaving the picture plane. In the end I solved this using ideas from the Newtonian dynamics of a point mass, combined with a random force and random starting place. How do you color such an object? My approach has been to use continuously varying colors which "float" from one color to the next. 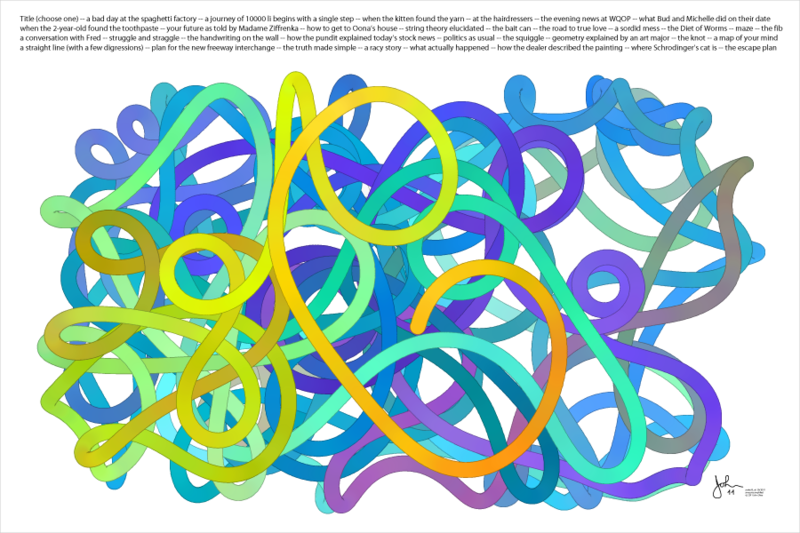 As one passes along the "snake" the color varies along a continuous path in color space, going from one color to another via a chain containing a full set of intervening colors. The choice of the path has been made randomly by using a random-walk process in color space. Abstract art can be associated with "metaphors". A winding one-dimensional path can be likened to a trip, path, story, or journey. One might think of it, for example, as an image of a human life -- passing from bright to shady and back as events happen. The text at the top has about 20 "titles" for the image, including some suggested by family and friends.